Background: Doogh is a typical Iranian beverage based on fermented milk. The common salt used for Doogh is NaCl. Addition of salt in Doogh can take place before or after fermentation. The type of salt (NaCl or NaCl/KCl) and the sequence of salt addition in Doogh production can have significant impacts on biochemical characteristics of this product. 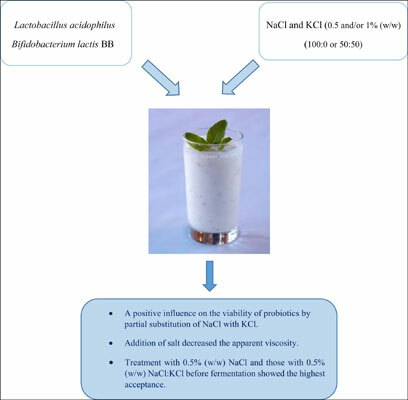 Methods: Nine probiotic Doogh treatments containing two probiotics (Lactobacillus acidophilus and Bifidobacterium lactis BB at the level of 107 cfu.mL-1) along with Lactobacillus delbrueckii ssp. bulgaricus and Streptococcus thermophilus, different salt percentages (0.5 and/or 1% (w/w)) in two ratios of NaCl/KCl (100:0 or 50:50) were prepared. Four samples were produced with the addition of salt before fermentation and four samples after fermentation (after cooling to 5°C). Apparent viscosity, phase separation, viability of probiotics and sensory properties of Doogh samples were studied during 21 days storage. Results: The results showed that samples containing 1% (w/w) salt (NaCl or NaCl:KCl) had higher phase separation than treatments with 0.5% (w/w). The partial substitution of NaCl with KCl had a positive influence on the viability of probiotics. Treatments with 1% (w/w) NaCl:KCl and 0.5% (w/w) NaCl:KCl added before fermentation showed the maximum viability of probiotics. Addition of salt decreased the apparent viscosity of Doogh due to decreasing mean particle size of the dispersion system. From sensory point of view, the treatment with 0.5% (w/w) NaCl and those with 0.5% (w/w) NaCl:KCl before fermentation showed the highest acceptance. Conclusion: A low-sodium Doogh with an acceptable probiotic viability was produced. Keywords: Doogh, potassium chloride, probiotic, sensory, viability, viscosity. Keywords:Doogh, potassium chloride, probiotic, sensory, viability, viscosity.